290 pages | 15 B/W Illus. This comparative study examines what kinds of societal forces shape European relationships towards democratic political life in contemporary Europe. Drawing on data from the European Social Survey (ESS), the book develops a theoretical perspective on the relationship between social structure and democracy and links this to research on social capital and political behaviour. The authors explore the impact of individual social characteristics on a broad range of the Europeans’ political attitudes and behaviours. They investigate how the social position of the individuals in the European societies contributes to the explanation of the national and cross-national patterns of political engagement, addressing trust in the social and political environment, life satisfaction, party preferences and attitudes towards migration and migrants. 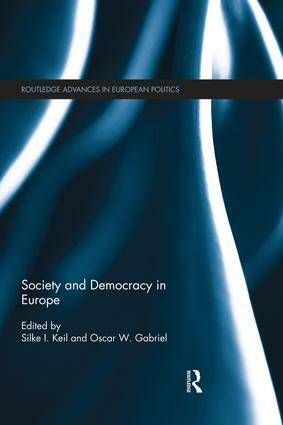 Providing detailed descriptions of the similarities and differences among the various European publics at the beginning of the 21st century, Society and Democracy in Europe will be of strong interest to students and scholars of European politics, political participation and political sociology. Oscar W. Gabriel is Professor of Political Science at the Institute of Social Science at the University of Stuttgart, Germany and associate researcher at the Institute of Political Studies in Bordeaux (France). His research interest focuses on comparative analyses of political attitudes and behavior, particularly on trust and support, political norms and values and social and political participation. He has extensively published in these areas, conducted a large number of national research projects and participated in several international projects. Currently, he is conducting a research project on citizens’ attitudes towards representation and representatives in France and Germany. He is member of the German ESS-NCT. His recent book is "Germany, Austria and Switzerland in the New Europe" (2010, with Fritz Plasser). A publication on "Political Participation in France and Germany" (2011, with Silke Keil and Eric Kerrouche) is in progress. Silke I. Keil is Assistant Professor of Political Science and Political Sociology at the University of Stuttgart, Germany. Her main research areas are political sociology, particularly political attitudes, participation, social capital and electoral behavior. She was general manager of the German European Social Survey NTC. Recent publications in progress (will be published in 2011): Political Participation in France and Germany (edited with Oscar W. Gabriel and Eric Kerrouche, ecpr press) and Metamorphosen Deutschlands: Einheit und Differenzen in Europäischer Perspektive (edited with Jan W. van Deth, Nomos).